DeforestACTION ‘Eco Warriors’ Expose the Horrifying Truth of Environmental Vandalism in Borneo | Collaborate for Change! For the last twenty days, the DeforestACTION EcoWarriors have been on a life changing journey through West Kalimantan, Indonesia, seeing first hand the destruction caused by Deforestation. What they have seen, and what they will be reporting to the world, is far more shocking than any of them expected. The EcoWarriors are young adults (aged 19-35 years) who were selected from hundreds of applicants to represent the children responsible for establishing the DeforestACTION project. They are truly an amazing, accomplished and inspirational group, including professional GIS technicians, veterinary technicians, journalists, teachers and more. You can learn more about the Eco Warriors here. In the last twenty days, the EcoWarrios have uncovered a largely unreported story of what can only be described as genocide, where local people are being killed, cheated, poisoned, held without trial and brutalized under the lead of foreign owned palm oil companies. The environmental devastation being deliberately imposed on the lands they own makes the BP oil spill look like a wine stain. The way animals are being treated is something from a horror movie. And the intricately constructed public relations campaign that shrouds the truth is of a scale that defies belief. In one 30 minute boat ride, the EcoWarriors saw nearly forty illegal gold mines, each of which pumps over a litre per day of mercury directly into the river ecosystem. The few fish that are left are contaminated with heavy metal and not safe to eat, and their breeding cycles are so disrupted new generations will be fewer. The water is so polluted it is beyond dangerous for bathing, let alone drinking, cooking or irrigation. Life expectancies from those dependent on the river system (hundreds of thousands) is dropping by the day. Miscarriage rates are skyrocketing. The IQ rate of local people is being severely impeded. And that’s just the tip of the iceberg. Rewind to March this year. A beautiful water hole that took nearly an hour of forest trekking to get to was surrounded by thick virgin rainforest as far as the eye could see. Now, only a few months later, this creek is too polluted to touch, and there is no forest visible for kilometres to the horizon. All that is left is devastated land, with rows of recently planted palm oil saplings – a biological desert that can sustain no animals, and provides less than .01 jobs per hectare for the local people. Huge profits are made offshore. 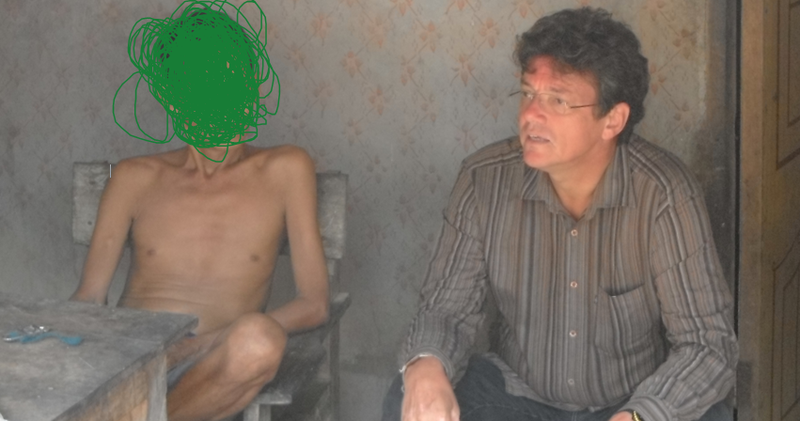 The locals in Indonesia are left destitute. This story is commonplace in Borneo. Somewhere in Kalimantan, this story is playing out again right now. It is happening so fast (300 football fields per hour). The amount of CO2 being pumped into the atmosphere from the clearing of the peat swamps is comparable to that of a volcano. Turn off your light bulbs when you can, but understand this amount of release, from these peat swamp regions alone, in only a few months, emits more CO2 than Australia does in a year. It’s getting worse by the day. The problem is truly global in nature, but the really scary stories come from the local people themselves. Dr. Willie Smits translates for this man who explains how he has lost his land, his family, his livelihood and his hope at the hands of palm oil companies, who use the most sinister, evil and calculating tricks to cheat the local people. This man (identity withheld at his request) was one of hundreds the EcoWarriors spoke with. He talked of how his lands had been stolen by a palm oil company. He explained how the company had used deception, deceipt and nefarious trickery to destroy his people. Others spoke of how officials from their tribes were invited to Jakarta for special meetings promising prosperity and to ‘explain how they could make money from planting new crops on their lands’. On such stays, , the companies seduce the leaders with drugs, alcohol and prostitutes, film them, and use this footage to blackmail the tribal leaders to sign away their lands. Similar stories were repeated by other local people in tribes across Kalimantan. Others reported how the palm oil companies provided two documents for people to sign, one for those in favour of palm oil, the other for those against. The local people uninimously signed against, but learned the documents had been switched, and they had been tricked into signing their lands away. They have no recourse, no right of reply, and no appeal process. Within days, the forest they had lived on for centuries were gone, and they were forced to move on, destitute and hopeless. The palm oil companies evangelise their ‘Job Creation’ schemes. They use carefully constructed, politically comfortable, and publicly palatable catch phrases to deceive the world about what is really going on. This will all be exposed. The man in the picture above explaned how his family had been forced off their own lands. That the jobs they were promised were based on lies and smoke screens, and those who conceded to work for the palm oil companies are now treated as slaves. The company took double the land they had said they would, stole the timber, which was send downstream as part of a constant, and blatant parade of criminal exploitation – a sort of proudly defiant challenge to the rest of the world begging the questions: “How can this be allowed ?”. These stories were repeated by locals from far and wide, throughout the massive district of Sintang. The more remote the villages, the more horrific the stories. The endless parade of illegal timber can be seen day and night in the river systems of Borneo. Trees with a diameter less than 50cm (minimum legal size) comprise the majority of logs in this floating monstrocity. All the larger trees are gone. When the local people in his tribe eventually fought back and tried to reclaim their land, over 30 children were thrown in jail for nearly fifty days without trial. 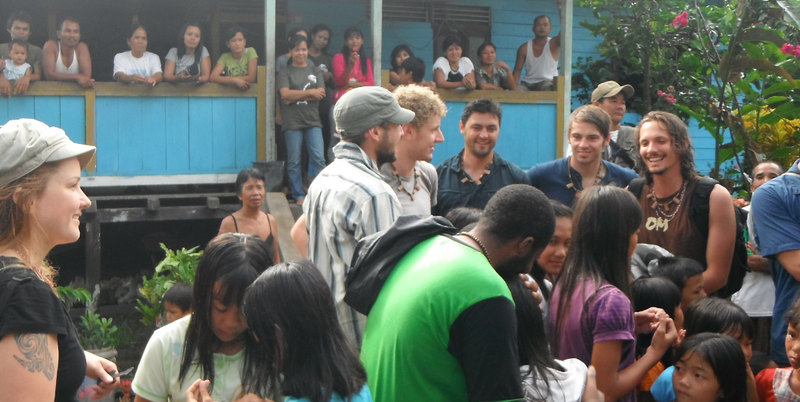 They have since fled and live in poverty across Indonesia. This interview, and many others were filmed by the journalists, documentary makers and EcoWarriors following this story. As I write this, there is a tense standoff occurring with the villagers of Lansat Baru, Lansat Lama and Belenyut Sibau and the palm oil companies. Buldozers and giant excavators are destroying their forests right now without any permission, agreements or authority. There are a number of film crews on the ground recording this, hoping awareness may help save what is left. See below an email from Emily Hunter (EcoWarrior), describing what is happening at this moment. Dr. Willie Smits , an Indonesian national, and one of the most highly regarded and celebrated environmental ecologists on the planet, is working in partnership with the EcoWarriors to bring these stories to the world. 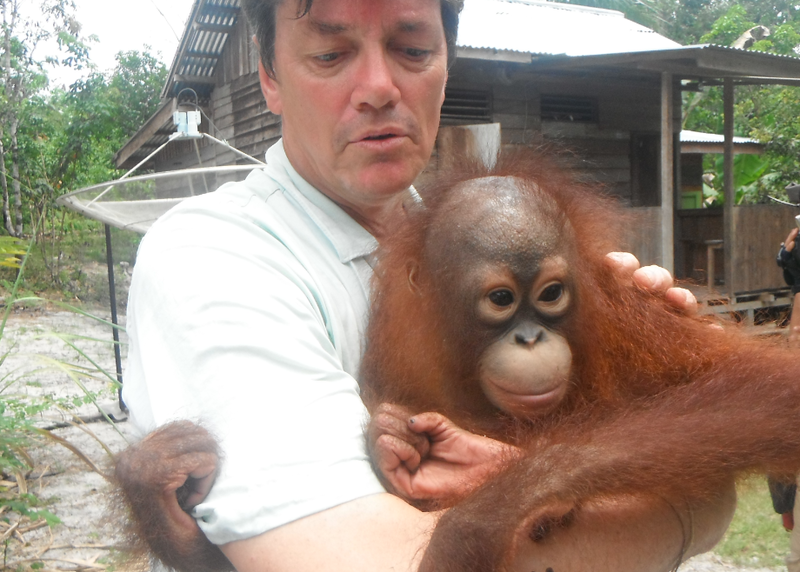 He has dedicated his life to saving the forests of the planet and is considered the world’s foremost expert in Orangutans and other Indonesian Wildlife. He is also a critical part of the DeforestACTION educational team, working with students around the globe to provide the latest scientific, political, cultural, historical and conservation information available. (Understanding 54 languages and having a near-photographic memory makes it easier for him to stay across all the research available). Independent journalists have accompanied the team, along with film makers, print journalists, and documentary makers, to ensure completely transparent, first hand accounts of this project and what it bears witness to. Willie Smits rescues Jojo - a baby orangutan who was kept in a small wooden box for the last year, and fed coffee, cigarettes and junk food. Within a few days of being rescued her face has come alive, she is happy, active and surrounded by loving carers. In the coming months, the EcoWarriors will be working to bring these and other messages to the world with compelling footage and undeniable evidence. They will be working with local people to create sustainable alternatives to Palm Oil, to regrow rainforest, to rescue wildlife, and to work with students in schools around the world, so they can have authentic, empowering and meaningful learning experiences. They are the first of many EcoWarriors who will carry out the on-the-ground components of the DeforestACTION strategy. If you haven’t done so already, be sure to join our regular DeforestACTION webinars, or notify your local school they are happening. They are specifically designed for students from school age to post secondary, and are accompanied by virtual online classrooms, teacher guides, lesson ideas and DeforestACTION education materials. These are solutions focussed, designed to engage and inspire hope. They are regularly updated and revised. The demand for Willie Smits from local people in Borneo is endless. Across Kalimantan the villagers are begging for more information from Willie Smits on sustainable alternatives, and to learn about the magic of Sugar Palm as a real solution. Stay tuned for some of the most unbelievable footage you are ever likely to see. Visit www.deforestaction.org to keep up with the EcoWarriors. On Sunday, a group of approximately 40 Dayak people began the first day of a weeklong protest to reclaim their land 80 kilometres outside of Sintang in West Kalimantan, Borneo. The action represents a last stand to defend their ancestral land against palm oil company encroachment. He said the company has tried since 2008 to occupy the land by inciting conflict among villagers and bribing officials. The land fringes on a 1,000 hectare forest believed to be home to 40 orangutans. According to several other villagers, bribery and the use of forged land certificates are common tactics used in the takeover of their ancestral lands. These lands are passed down from the previous generation and do not come with any official documentation. The lands are ruled under the adat or traditional law, which protects the rights of the Dayaks, they said. With the latest infringement on their land by the company and talks with its representative breaking down – company officials abruptly left discussions before the Dayaks demands were presented – the villagers decided to take stronger action. After writing a letter of appeal to the Sintang Bupati, the villagers escalated their protest by confiscating the company’s heavy equipment. On Sunday, after a traditional ceremony, the villagers uprooting several palm oil saplings as a symbolic reclamation and erected a road blockade to the palm oil planation to send strong signals of their defiance. “If this land is ever stepped on by any occupier, we will fight and defend it to the death,” said the spiritual leader during the ceremony as he summoned 20 Dayak gods. For now, the villagers wait and watch, wary but ready to defend their land against unwanted outsiders. on December 21, 2011 at 5:34 am | Reply A new wave of hope for our forests – our best chance ever? « Collaborate for Change!